Before Buckeye Lake dam failed, Noah’s Ark was a Little Golden Book on Jon Fortner’s daughter’s bookshelf. 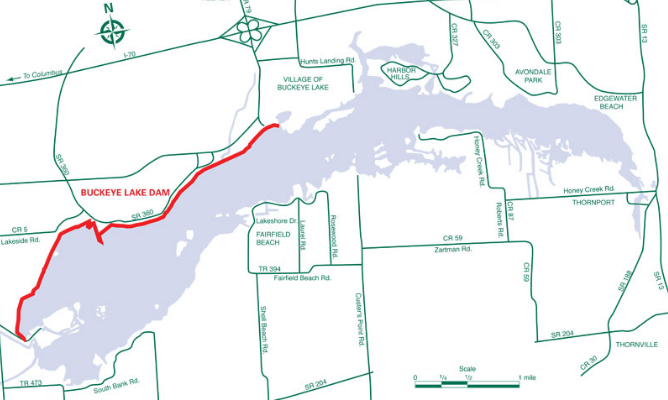 Before Buckeye Lake dam failed, engineers from the U.S. Army Corps said there was a high likelihood of a dam failure and the safest measure would be to drain the lake permanently. The cause of concern stemmed from the homes, which began sprouting up about a century ago, after the state’s approval, as well as the docks placed into the lakeside of the dam that have now “displaced or disrupted large portions of the embankment, significantly weakened by the more than 370 homes and other structures that have been sunk into the 4.1-mile earthen dam.” The 177-year-old dam no longer met current safety requirements. Before Buckeye Lake dam failed, state officials said they would analyze the report and make recommendations along with holding public meetings for input before making a final decision, which would take several weeks. Before Buckeye Lake dam failed, dams could fail for one or a combination of the following reasons: Overtopping caused by floods that exceed the capacity of the dam, deliberate acts of sabotage, structural failure of materials used in dam construction, and inadequate maintenance and upkeep, among other things. Before Buckeye Lake dam failed, the kind of action required to repair the dam would make it impossible for most boating since the water would be too shallow for summer levels, harming the establishments surrounding the lake in Thornville and Millersport (bars, restaurants, shops, marinas, rental businesses) so dependent upon the summer recreation season for financial viability and survival would suffer immensely. Before Buckeye Lake dam failed, dams were considered a necessary measure for man’s expansion, a product for helping contain inconvenient bodies of water. Before Buckeye Lake dam failed, there was no procedure for recovering the dead from a dam failure. No best practices. No plan for catastrophic failure once it occurred. The process limited to a select few, like in Danover, Michigan, where floodwaters once swept through the town just after school got out and men had to dig through the mud and debris to unearth the bodies of their children. Before Buckeye Lake dam failed, a series of dam failures in the 1970s resulted in a national focus on inspecting and regulating dams. On February 26, 1972, a tailings dam owned by the Buffalo Mining Company in Buffalo Creek, West Virginia, failed. Within minutes, 125 people were killed, 1,100 people were injured, and over 3,000 were left homeless. On June 5, 1976, Teton Dam, a 123-meter-high dam on the Teton River in Idaho, failed, causing $1 billion in damage and leaving 11 dead. Over 4,000 homes and over 4,000 farm buildings were destroyed as a result of the Teton Dam failure. And in November 1977, Kelly Barnes Dam in Georgia failed, killing 39 people, most of them college students. Before Buckeye Lake dam failed, Ohio Department of Natural Resources spokesman Lana Bianca said the dam was designed as a canal feeder lake, not as a flood control reservoir, and not designed for its current usage: “The dam failed in 1834 and was repaired, and then sustained near failures in 1968, 1990, 2003 and 2006,” Bianca said. Before Buckeye Lake dam failed, a house, like a dam, was a promise of safety. Before Buckeye Lake dam failed, Lee Kabak, vice president of the Buckeye Lake Region Chamber of Commerce, said he did not think there was any imminent danger and area businesses needed the gates closed to allow the water level to rise to its summer level. “There have been many studies. They have evaluated it previously, but the report found them outdated and incomplete and unreliable,” Kabak said. Before Buckeye Lake Dam failed, despite his wife’s protests, Fortner carried her across the threshold of their new home. Before Buckeye Lake dam failed, the dam in Johnstown, Pennsylvania collapsed beneath the burden of heavy rains. On May 31, 1889, after the catastrophic failure of the South Fork Dam on the Little Conemaugh River, residents woke to the sound of thunder. Tons of water came crashing down the narrow valley. The wave annihilated homes and farms in its path, reaching as high as 60 feet and moving at over 40 miles per hour. The desperate tried to escape, clinging to debris that would save some and crush others. And then there was the destroyed wire works that the wave claimed, unspooling miles of barbed wire. The helpless became entangled. The wave only lasted 10 minutes, but the worst was yet to come. When night fell, those who were left huddled on roofs and attics to wait out the night. Others floated along on debris that was swept downstream to the old Stone Bridge. Piled up against the arches, the debris caught fire, entrapping 80 people who had survived the initial flood wave. Before Buckeye Lake dam failed, Johnstown was the worst dam failure in U.S. history. Before Buckeye Lake dam failed, draining Buckeye Lake, replacing the 4.1-mile Buckeye Lake dam, and relocating the 3,000 people within the “inundation zone,” were all options being considered. The moment before Buckeye Lake dam failed, at 3:17 in the early morning hours, a stray dog crossed Hebron Road on his way to the Dumpsters behind Our Lakeside Diner. Geese on the lake sensed danger before taking flight. The first signs of catastrophic failure began. Before Buckeye Lake Dam failed, the Village of Buckeye Lake slept in their beds. Mike Salisbury’s fiction has appeared in Black Warrior Review, Midwestern Gothic, and Crab Orchard Review, among others. Mike is a recent graduate of the MFA program at Pacific University. He lives with his wife and daughter along Michigan’s West Coast.